Is it appropriate to take notes during a job interview? Generally yes, and the way you do it sends messages about you that can help you get the job – or lose it. Here’s how to take notes during an interview. 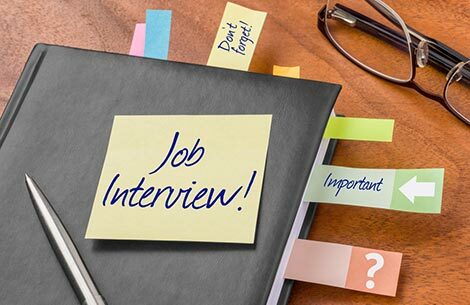 First, show consideration for the interviewer by asking, “Is it all right if I take a few notes?” Most will say “Of course,” but if the interviewer has any objection simply smile and go along with their preference. After all, they invited you, you’re on their turf, and they’re running the interview. If the interview is taking place over the phone, your note taking is invisible and it would seem odd to ask about it, so just go ahead – but don’t use a laptop. Should you take notes on a laptop or other device? It’s generally not a good idea, for various reasons. For one thing, the physical bulk of a laptop creates a sense of a barrier between you and the interviewers. That may be more symbolic than real, but in an interview perception is reality: anything that diminishes the feeling of rapport and connection is to be avoided. Then there’s the distraction factor. Even if you know you won’t be interrupted or distracted by notifications or messages on your tablet or phone, the interviewer doesn’t know that. And the interviewer himself (or herself) may find the device distracting for various reasons, including the sound of the keys clicking. As well, an interview is a learning experience, and a growing body of research suggests that note-taking via keyboard doesn’t facilitate learning as well as taking notes by hand. Last but not least, there’s that matter of politeness and etiquette. At this writing in 2018, many interviewers simply feel it’s not good form. That, in itself, is enough reason to use a notepad instead. Does it matter what kind of notepad and pen you use? A notepad that’s junior legal-sized may be better than a full 8 ½ x 11; being less bulky it calls less attention to itself. For the most professional impression, use an attractive organizer that holds a notepad. A high quality pen might be a plus, especially for an executive. What about the process of taking the notes? Quickly jotting down the occasional fact or detail sends the message that you’re well organized and make a point of keeping track of information given to you. On the other hand, continually taking notes may raise questions: whether you’re really listening, whether you have a problem with memory, whether you’re able to think on your feet. Laboring to take notes in full sentences, word for word, looks inefficient, and may give the interviewer the feeling they need to slow down and wait for you. That’s no good! Writing just the key points and phrases looks a lot smarter. Learn how to take fast, abbreviated notes. It’s a skill that will serve you for the rest of your life. What about notes I’ve made for myself beforehand? Can I bring these into the interview? Referring to notes to help you remember what you want to say during the interview is generally a bad idea. You’re expected to know about your qualifications and your accomplishments; having to look at notes can raise doubts about your memory skills or even the authenticity of what you’re saying. The exception is that it’s usually fine to refer to a list of questions you want to ask the interviewer. What should I do with my notes after the interview? What you found out about the role, the work and the company. Names, titles and other information for any people you met, including the receptionist, the shuttle driver, etc. Your impressions and “gut” feelings about the interviewer(s), the role and the company, including the atmosphere of the workplace (noisy? quiet? fun? serious? etc.). What questions the interviewer(s) asked you. What stories and examples you talked about. Anything important you didn’t get around to mentioning. Any questions you wish you had asked. What the interviewer(s) seemed to like best about you; what impressed them. Any concerns the interviewer(s) seemed to have, or anything that went wrong. Any personal information the interviewer(s) volunteered, especially if it’s something you have in common. Anything else you think of that might be important. This gives you a chance to fill in the holes left by the sketchiness of your note-taking during the interview. Good interview note-taking can help you write better thank-you notes, prepare strategically for the next round of interviews, decide whether you want the job and even negotiate the compensation package – all in a more well-informed way.